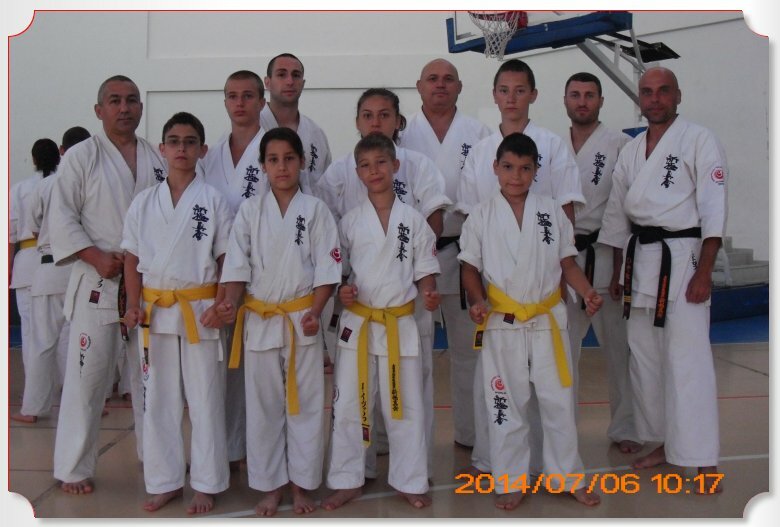 From 01.07.2014 to 06.07.2014 in Primorsko was held the traditional technical summer camp in Shinkyokushin karate. In this large event of the Bulgarian Karate Shinkyokushin Federation took part around 300 karatekas from clubs of the whole country. Georgi Popov – V dan /senior instructor of the National team for men and women and technical director of BKSF/. Training sessions were held twice per day in a very friendly atmosphere and all participants in them could have a taste of the mastery of some of the greatest names in Shinkyokushin karate. On 02.07.2014 was held an exam for a higher level of technique – 2nd kyu, 1st kyu, I dan, II dan and III dan. Of SC “Kyokushin” Shumen a successful exam was taken by: the chairman of the club sensei Stoian Obretenov, who reached III dan and Ivelina Petrova, who is second kyu. The competitors of SC “Kyokushin” Shumen came home enriched with many new friends and experiences. 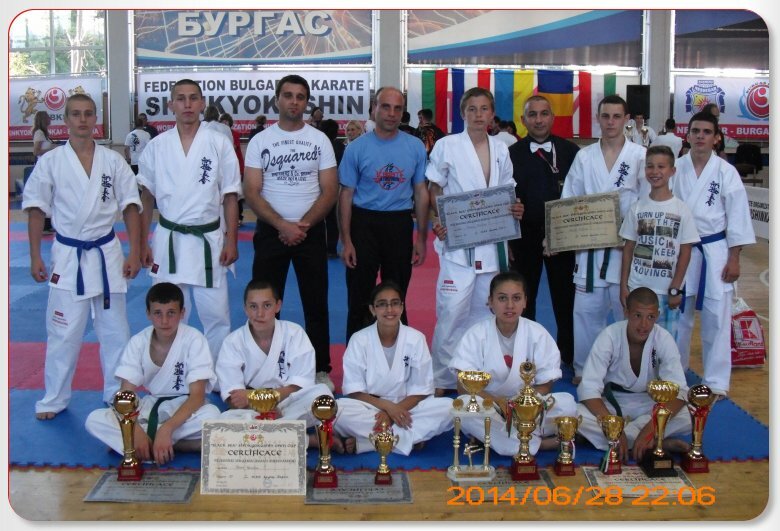 Оn 28.06.2014 in the “Boicho Branzov” hall in Burgas was held the International tournament for the “Cherno More”cup in Shinkyokushin karate for juniors and kadets. In the competition, which was organized perfectly by the hosts, took part karatekas from five countries – Hungary, Romania, Ukraine, Croatia and Bulgaria. Among them were many young talents of the Bulgarian Karate Shinkyokushin Federation from clubs of the whole country, in which were also a part of the competitors of the National teams for juniors and kadets. An exceptionally strong performance was made by the competitors of SC “Kyokushin” Shumen /with chairman Stoian Obretenov – II dan /, who won 3 gold, 3 silver and 3 bronze medals. 1. Ivelina Petrova in the juniors 55kg category, who won her final match against Ivelina Ivancheva of SC “Tornado” Pazardzhik with avasete ippon after excellently placed djodan mawashi geri and chudan mae geri. As well as the first place in the category, she also was unanimously awarded the prize for the best technique in this age group. 2. Dzhaner Shukri in the kadets 65kg category, who in his semifinal defeated Damian Dimitrov of ASKC “Trakia” Plovdiv and in his final decisively won against his Ukrainian opponent, Taras Skorik. 3. Kaan Shukri in the kadets, 50kg category. 3. Nesrin Nezhdet in kadets, who won her semifinal match by ippon with chudan mawashi geri. 1. David Aleksanyan in kadets, who won his first match by ippon with shita ski. 2. Aleksandar Stanchev in juniors. Petar Aleksandrov also performed very well in juniors, missing out on joining the medalists by very little. The competitors of SC “Kyokushin” Shumen were able to take part in International tournament for the “Cherno More”cup in Shinkyokushin karate for juniors and kadets thanks to the timely help of the Municipality of Shumen. On 20.06.2014 SC “Kyokushin” Shumen was host to an exam for a higher level of technique /kyu/ in Shinkyokushin karate. 100 karatekas of Shumen, Novi Pazar, Veliki Preslav and Tzarev Brod underwent this difficult challenge, with 67 of the fighters representing Shumen’s club. Sensei Dimitar Trampov – IV dan /many awards from European championships/, sensei Daniel Dimitrov – III dan, senpai Stoian Obretenov – II dan and senpai Ivan Bezus – II dan. The exam contained the three main components of Shinkyokushin karate – kihon, kata and kumite, as well as incredibly difficult physical test. All participants successfully passed, showing great technical growth, strong fighting spirit and excellent physical conditioning. The competitors of SC “Kyokushin” Shumen continue their preparation for the upcoming International tournament for the “Cherno More” cup in Shinkyokushin karate for juniors and kadets, which will take place on 28.06.2014 in Burgas.